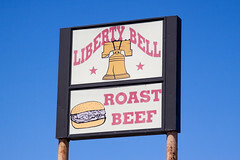 The next planned stop on the Boston Death March was Liberty Bell Roast Beef. If I had to pick one particular sandwich that represented Massachusetts, it would have to be the roast beef sandwich. Sure, the Lobster Roll is a contender as well, but that’s more of a “Coastal New England” thing, whereas a quick trip through Massachusetts will show that there is no shortage of roast beef places. The epicenter is the North Shore, with no end of places selling roast beef sandwiches from small restaurants and shacks (most of which sport someone’s first name, like Nick’s or Kelly’s), but they are found throughout Massachusetts, with Boston lying on the bottom edge of what I call the “Roast beef sandwich belt”. And Liberty Bell Roast Beef was right on our route, so it was obligatory that we stop there for a break. 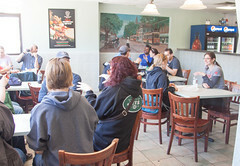 Liberty Bell is one of those typical MA roast beef shop: a basic shop with tile floors, somewhat spartan furniture, and an ordering counter, and little else. 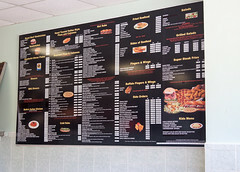 Like most of the other roast beef places, Liberty bell has the standard roast beef shop menu: about a half dozen varieties of roast beef sandwich in different combinations, and then a gazillion options for “all things fried”, with a lot of seafood. But for me, the choice was obvious: I came here for a roast beef sandwich, and a roast beef sandwich is what I ordered: a “King Size” with horseradish sauce. A good North Shore-style roast beef is really a simple sandwich: rare (it must still be pink!) roast beef, sliced thin, piled onto a soft onion rolls, and doused with either BBQ sauce or horseradish sauce (I prefer the latter, especially if it’s a good horseradish sauce). 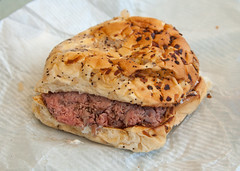 And the King Size from Liberty Bell was a particularly good exemplar of the type: a nice onion roll with a bit of crispiness to it, a substantial inch-thick layer of thin, pink, and juicy roast beef, and a rather pungent horseradish sauce with detectable bits of grated horseradish in it. A particularly good roast beef sandwich, and it even had a particularly good price tag ($6.95, which at most places around Boston these days only gets you a meager “small” sandwich). As an aside, the staff at Liberty Bell was particularly friendly. A group of 18 or so people, most of us with cameras, descending upon a small restaurant like this and taking over all of the seating often gets a comment from the staff, and Liberty Bell was no exception. The woman at the counter was very pleased that Liberty Bell made our itinerary, and she was a gracious host explaining the history of the joint and describing the clientele. We rather enjoyed our sandwiches (the best roast beef I’ve had in Boston itself), and I’d be more and happy to return on another trip. You know, I get a lot of odd requests in life. One of the odder ones in recent history was, “Hey, can you send me a bunch of photos I can use for a training funeral?”. Since yes, among the various colorful people I know are not only legislators, lawyers, professors, Lords, and actual rocket scientists, but funeral home directors as well. My answer was, of course, sure. I assembled an eclectic selection of photos of myself (you know, like the one with the horse mask, or the bathtub one, or the creepy cowboy one) and thus, the legend of Paul Crawford was born, a man who bears a shocking resemblance to myself, but, alas, departed this world late last year. Sniff. It’s like I know the guy. In any case, part of the deal was that I would get pie (dutifully delivered via Fedex), and, if I found myself in Florida, dinner. Thus, on a somewhat recent trip to Daytona for testing at Embry-Riddle, I found myself with an opportunity to meet up with my friend Leslie, have a nice dinner at De La Vega with her and her husband, and raise a glass in memory of poor Paul Crawford.